Charles Bradley, 'Screaming Eagle Of Soul,' Dies At 68 : The Record The singer, inspired as a teen by James Brown, didn't release his first album until 2011, at the age of 62. For the six years that followed, through a battle with cancer, he never wasted a moment. Charles Bradley performing on July 16, 2017 in Louisville, Kentucky. Bradley passed away on Sept. 23, 2017 at the age of 68. 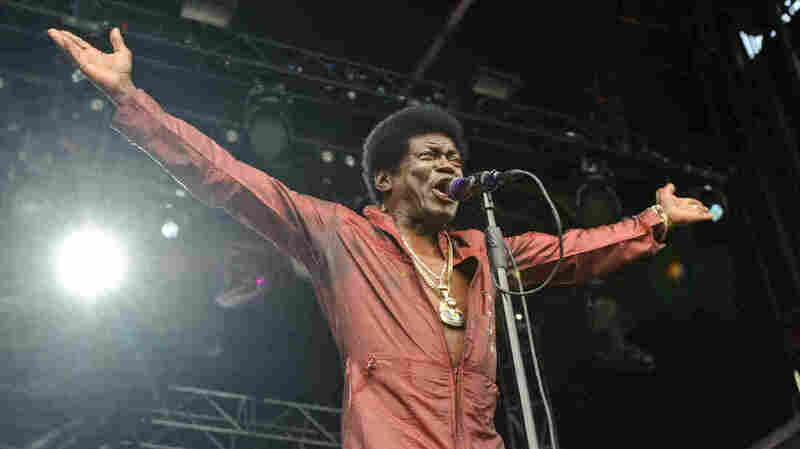 Charles Bradley, the "Screaming Eagle of Soul," whose late-blossoming career was built on fiery performances that evoked his idol, James Brown, died in Brooklyn on Saturday, Sept. 23, according to a statement by his publicist. In 2016, Bradley was diagnosed with stomach cancer, which spread to his liver. He was 68 yeas old. Known for a powerful and pained rasp that he used to channel both his demons and deep gratitude, Bradley released his debut album, No Time For Dreaming, at 62. He would become a totemic artist for the Brooklyn label Daptone, best known for its revivalist '60s soul. "Charles was truly grateful for all the love he's received from his fans and we hope his message of love is remembered and carried on," a statement from Daptone read. "Thank you for your thoughts and prayers during this difficult time." Born in Gainesville, Fla., Bradley grew up in Brooklyn but left home at the age of 14. "If I'm not wanted, I'm gone. And I left," he said in a 2013 interview. He spent much of his life itinerant, performing at one point in Maine — where his band was disbanded due to the Vietnam draft, as he told the Chicago Tribune in 2011. From there he headed west, working odd jobs and seeking out chances to sing. In his 40s, he moved back to Brooklyn and began performing as James Brown impersonator under the name Black Velvet before being scouted by Gabriel Roth, a Daptone co-founder and recording engineer, though he continued to perform under the pseudonym while developing a career under his given name. After the release of his debut album, Bradley began touring extensively, invariably closing his shows by descending the stage and thanking his audience, extending hugs to all. "Charles was somehow one of the meekest and strongest people I've ever known. His pain was a cry for universal love and humanity. His soulful moans and screams will echo forever on records and in the ears and hearts of those who were fortunate enough to share time with him," Gabriel Roth writes in a statement. "I find some solace knowing that he will continue to inspire love and music in this world for generations to come. I told him as much a few days ago. He smiled and told me, 'I tried.' It was probably the simplest and most inspiring thing he ever told me. I think he wanted to hug each person on this planet individually. I mean that literally, and anyone that ever saw him knows that he honestly tried." Bradley, at a listening party for his 2016 record Changes, told this reporter — in a conversation often punctuated by Bradley holding up a finger, smiling and singing along to his new record — he'd helped construct the studio in which he'd later record. The studio, within a nondescript house in Bushwick, Brooklyn that doubled as the Daptone office, was the same used for Amy Winehouse's Back To Black. Bradley and his mother reconciled after his move back to Brooklyn in the early '90s — but his dedication to his new life was abiding. The night she died, Bradley went forward with a sold-out show at Brooklyn's Music Hall of Williamsburg in 2014. "I'm gonna say it's all right to dream, but work at it — make it come to reality," Bradley told NPR around the time No Time For Dreaming was released. "It took 62 years for somebody to find me, but I thank God. Some people never get found." Sept. 23, 6:27 p.m.: This article originally misstated the name of Amy Winehouse's album Back to Black as Black In Black.